Cams are the mechanisms that add life to our automata. As many people have noted, they can be viewed as a type of ‘memory’ that allows the mechanism to perform the same motion over and over again. Cams can’t do it alone, however. Cams are usually paired with a cam follower that translates the shape of the rotating cam into a linear motion. Let’s take a look at some practical cam follower designs. First, let’s start with a few terms. A plate cam or disk cam is the disk-shaped piece mounted on a rotating axle. The cam follower is the the part that rides on the edge of the cam. The bearing or guide is the hole through which the rod attached to the cam follower must pass. The axle rotates, turning the cam with it. The changing diameter of the cam causes the follower to rise and fall. This motion is carried by the follower shaft to some other part of the machine. The cam follower can take various forms. The knife-edge follower is very thin. This means that it will be able to follow the contours of the cam closely. 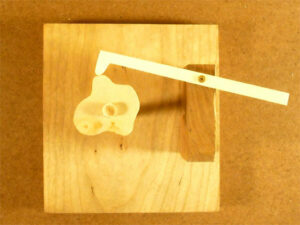 The cam should not be so intricate that the knife-edge gets caught in the cam’s depressions, however. The knife-edge cam follower design creates a lot of wear on both cam and follower. Usually, we don’t require this kind of precision and can use one of the other cam follower types. The spherical shape allows this follower to stay close to the cam’s surface without getting caught or wearing excessively. Keep in mind that the follower must be able to drop into any of the depressions on the edge of the cam. If these depressions are too small, the motion will not be transferred accurately. The simplest form of spherical cam follower is a simply a dowel with a rounded end. Friction is a recurring issue. The roller cam follower addresses this problem. 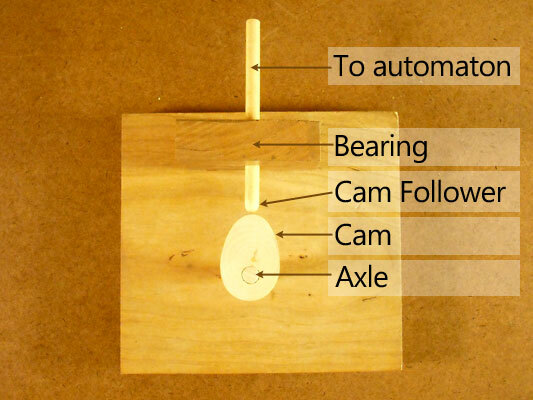 The small wheel of the roller cam follower spins along the cam’s edge. This can work well when there is a somewhat heavier load directly over the cam follower. 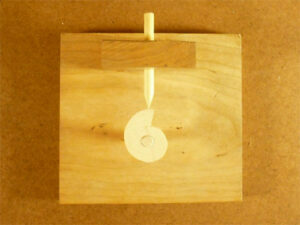 The flat cam follower usually consists of a disc of wood glued to the bottom of the cam follower shaft. The follower is easy to make and doesn’t require a lot of precision. The size of the follower can also increase the time that the cam is in contact with the follower. This type of follower works best with simple, oval shaped cams. Large flat cam followers can be used to create a rotary motion. 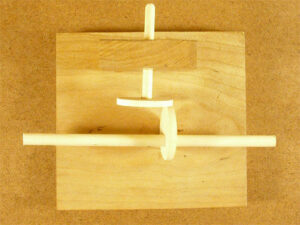 The trick is to offset the cam follower shaft so that the cam makes contact with one side of the cam follower. If you use one cam in this way, it will rotate the cam in one direction. A round cam in constant contact with the flat cam follower will produce a more or less continuous rotation. A lobed cam will rotate the cam follower periodically or cause it to lift and rotate depending on how close the cam follower is positioned to the cam. If two cams are used in the way just described on either side of the flat cam follower, the resulting motion will be a back-and-forth rotary motion. 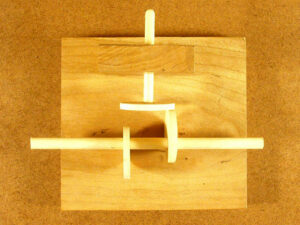 This combination of two cams and flat cam follower is the basis for many simple automata. The rotation in each direction can be limited as desired by placing stop pins on the cam follower or cam follower shaft. 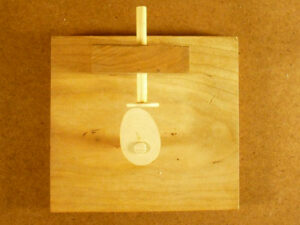 Cam followers can take the form of a hinged lever. This has some advantages. First, the bearing is no longer critical because the hinge keeps the follower in position. This can eliminate binding problems associated with the bearing. It is also easy to ensure that a hinged cam follower stays in contact with the cam at all times. 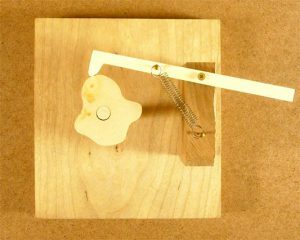 Because the entire arm moves up and down, mechanisms can be attached to various locations on the arm. 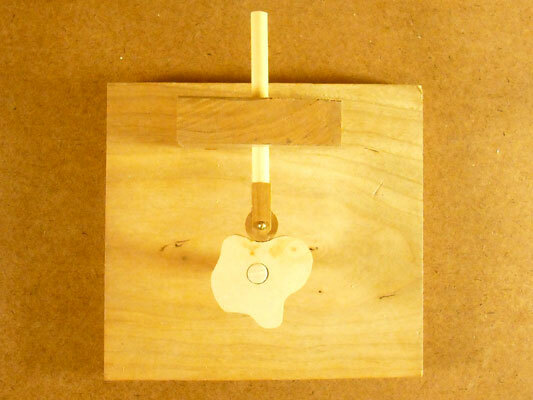 Keep in mind that the output motion of a hinged cam follower is an arc, not a straight line. Most often, the weight of whatever part you are driving will keep the follower against the cam. Sometimes it is necessary to ensure that this contact is maintained. 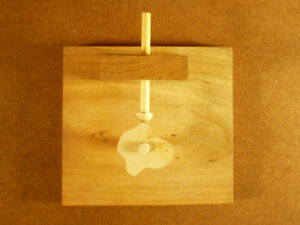 One option is to use a compression spring between the cam follower and the top of the mechanism box. In this situation, the spring pushes the follower down onto the cam surface. This can work well with large flat cam followers or spherical followers with a flat top. 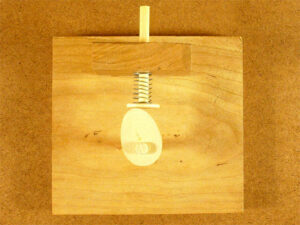 Another option is to use an extension spring between the cam follower and the base of the mechanism box. In this situation, the spring is pulling the follower onto the surface of the cam. This works well with hinged cam followers. Finally, you can hang some type of weight from the follower to keep it against the cam. Unlike springs, weights produce an even force throughout the range of motion. The size, smoothness, length, and placement of the bearing has a big impact on how well the cam and cam follower work together. The bearing must allow the cam follower shaft to move freely. Smoother is better. On the other hand, an oversized bearing will allow the the force of the cam on the follower to tilt the follower shaft which can cause it to jam. A long bearing will help to ensure that the cam follower shaft cannot tilt and bind. The placement of the bearing is also important. If you are having problems with binding, try shifting the bearing and follower so they are not directly over the axle when viewed from the side. Be prepared to experiment to find the best position for the bearing relative to the cam. Thank-You. As a beginner, slowly feeling my way through making my first simple automata, this is absolutely priceless! Dug thank you so much for sharing your knowledge and craftsman ship. I’ve seen hinged cam followers on web sites but this is my first good look at them. Thanks a lot for demonstrating these concepts. Thanks for your note. Feedback like yours is exactly what I hope to hear. Best of luck with your projects! Thank you so much! we are doing this for a school project. Thanks for sharing these valuable designs. The biggest challenge I’m finding in making my goofy displays with wiper motors etc is harnessing the motion and redirecting it, so these cams can be very useful. I appreciate the time & effort you put into providing this. This is great information Dug, thank you! Thanks Dug for sharing your knowledge . I have read a few automata books and they make it so complicating ! You have made it easy to understand and follow. We are glad to hear that. Thanks!